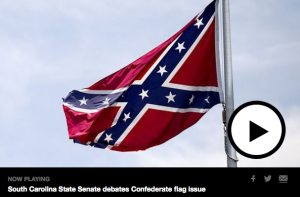 The South Carolina Senate voted Monday to pull the Confederate flag off the Capitol grounds, clearing the way for a historic measure that could remove the banner more than five decades after it was first flown above the Statehouse to protest integration. A second vote will be needed Tuesday to send the proposal to the House, where it faces a less certain future. But Monday’s 37-3 vote was well over the two-thirds majority needed to advance the bill. If the House passes the same measure, the flag and flagpole could be removed as soon as Gov. Nikki Haley signs the papers. The flag would be lowered for the last time and shipped off to the state’s Confederate Relic Room, near where the last Confederate flag to fly over the Statehouse dome is stored. As the senators spoke, the desk of their slain colleague, Clementa Pinckney, was still draped in black cloth.